Should I Use Mouthwash Regularly? Many of our patients at Dr. Q Dental in Monrovia are curious to learn our professional recommendations regarding such basic questions as how often to brush, what type of toothbrushes are most recommended by dentists, and which toothpastes are best for warding off tooth decay and gum disease. One common question our patients often pose is regarding the use of mouthwash and its effectiveness in encouraging fresh breath and diminishing the growth of harmful oral bacteria. Many of our patients also want to know what types of mouthwash dentists recommend most often. Is Mouthwash More Effective Than Water for Rinsing After Meals and Snacks? 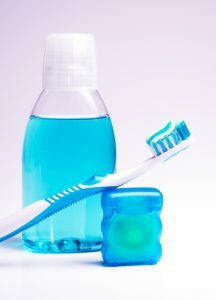 While water may help to loosen food particles and dislodge residue from food and drink that may adhere to tooth enamel, Dr. Q encourages her Monrovia-area patients to rinse with mouthwash after eating whenever possible, since mouthwash may provide the added benefit of actually combating the growth of harmful oral bacteria. Harmful bacteria may build up anywhere in the mouth, such as in the crevices and cracks between teeth, in the gum line where food residues may build up and cause the development of plaque, and even on the surface of the tongue. While water may help to diminish these effects, a good mouthwash can destroy harmful bacteria and prevent the development of plaque and tooth decay while also providing fresh breath. Some dentists also believe that the fresh taste left behind by a good mouthwash may discourage unhealthy between-meal snacking in some patients. What Type of Mouthwash is Most Recommended by Dentists? While most dentists agree that alcohol-free mouthwashes are best, most don’t recommend a specific brand, as there are many effective brands on the market. At Dr. Q Dental, we simply encourage our Monrovia patients to choose a mouthwash that contains no alcohol, while also avoiding those that may contain sugar or saccharin, and excessive amounts of colorants and dyes. Mouthwashes that contain mint oil are effective because natural oil of peppermint discourages the growth of harmful bacteria while freshening the mouth and promoting fresh, clean breath. Natural mint oil also helps dislodge harmful bacteria from the gums and tongue, as well as helping to remove food and drink residue from dental enamel. Mouthwashes that contain Xylitol are also known to be effective at reducing the development of harmful bacteria while nourishing the gums. If your mouth is often dry, Dr. Q may recommend a specialized mouthwash that addresses and treats symptoms of dry mouth, a condition that may lead to increased development of harmful oral bacteria, tooth decay, and gum disease. If you live in Monrovia and want a good dentist who cares about your oral health and provides continuing education and health tips for all of her patients, check out Dr. Q Dental, where our friendly staff is always on hand to answer your questions about how to maintain optimal oral health. To learn more about our comprehensive dental services, contact our office at (626) 599-9819.